Did you watch the Kentucky Derby? It was certainly a dramatic race, with last minute scratches, a favorite who stumbled right out of the gate, and a victor who’d never run on grass before. Beautiful horses performing very well with talented jockeys on board…that’s thoroughbred racing at its finest. Equally dramatic was range of hats being worn to this year’s Run For the Roses. There’s high fashion, I understand – but there were a few bonnets there that would have given even Lady Gaga pause. Why do people wear such outrageous hats? Maybe they think they’ll bring their chose horse good luck! Four leaf clovers are a traditional symbol of good luck. 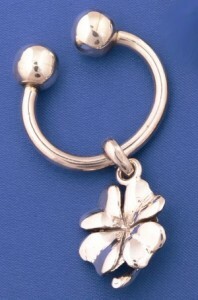 They look great rendered in sterling silver, as you can see in this Sterling Silver Lucky Clover Key Chain. Key Chains can serve as beautiful accessories too. Equestrian themed silver keychains are a nice way to showcase your sense of style and your love for all things horse. Hunt caps, helmets, horseshoes and riding boots shine as silver charms, a lovely accent to your key ring. Key rings are great gift items; equestrian keyrings can be enjoyed by men or women. Tiffany, the famous jeweler, produced several classic keychains that are sure to be of interest to collectors of estate horse jewelry or antique horse jewelry. These keychains remind one of bits and bridles, of time spent in the saddle, and of course, the classic four leaf clover to bring good luck. You can see these keychains here. Add a little fun, flash and style to your keyring! Shouldn’t your morning drive have some equestrian flair? Treat yourself!